Research from the Imperial College of London may help conquer the classic drone conundrum—how can you power a drone without weighing it down with a battery? Most drones you can buy normally have an operation time of around 10 to 40 minutes depending on the size of the drone and the capacity of the battery. Ideally, one wants to extend the flight operation time without adding on too much weight to the drone, which would result in a shorter flight time. This is a problem that drone operators have been facing for quite some time. It’s also interested some researchers in finding a solution. 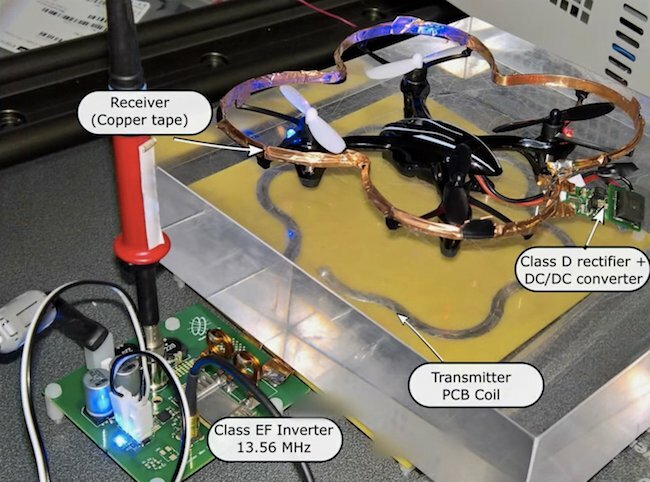 Dr. Samer Aldhaher, a research associate at the Imperial College of London working with the Wireless Power Lab has been researching wireless power transfer systems with the aim of powering a drone through wireless charging. It isn’t magic; the drone receives the power required to take off, operate, and charge itself from a charging block directly beneath it. His paper, published by IEEE and co-written by David C. Yates and Paul D. Mitcheson, details the construction of the Class EF2 inverter used in the tech. While this is a huge leap in what could be the next powering method of flying drones, there are still quite a few missing pieces to get this technology working on a greater scale. After watching the video, you might notice that the drone is restricted to only hovering over the wireless power transmitter below it. Dr. Aldhaher has figured out how to get it operational wirelessly, but only for about five inches above the power transmitter base. If the drone flies out of the transmitting range, it will lose its power and shut off. Nevertheless, this is a spectacular feat of overcoming the need for on-board batteries. Below is a picture of Aldhaher’s setup of both the drone and the power transmitter. Screenshot courtesy of Samer Aldhaher. Now that you have a basic understanding of the concept, let’s look a little further in-depth of how this concept actually works. The transmitting loop that is labeled as “transmitter PCB coil” is actually etched onto a printed circuit board, hence the name PCB. From an outlet or power generator, power is converted into high-frequency alternating current (AC) by the transmitter. From there, this high-frequency AC flows into the transmitter coil and will generate an oscillating magnetic field. 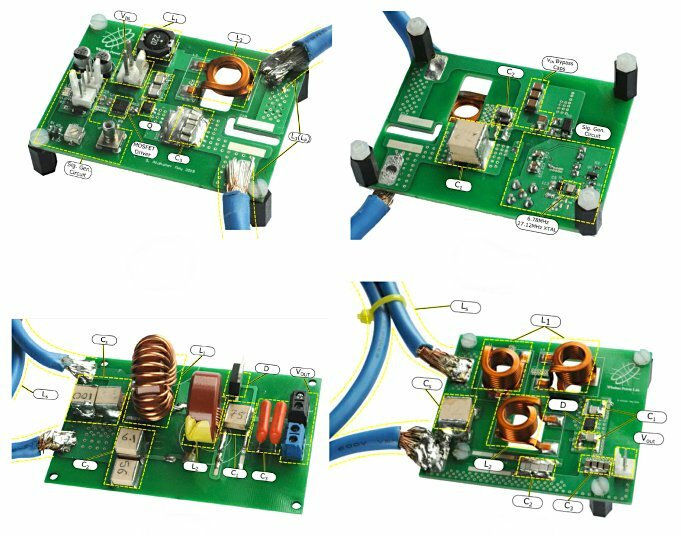 The EF2 inverter’s circuitry including the top side (top left), bottom side (top right), and rectifiers for the 6.78MHz class (bottom left) and 27.12MHz class (bottom right). Image courtesy of IEEE Xplore. Here is the awesome part: The magnetic field is transferred into the air and will induce into the receiver coil. Once the energy from the magnetic field induces AC into the receiver coil, it is then that it can be converted back into direct current (DC) by the receiver. The DC power can then provide power to the device—the drone, in this case. Copper is an excellent conductor of electricity because the valence electrons are free and repel each other very strongly, enough that it will cause repulsion of other electrons. Essentially, the electricity is forced down the piece of copper. While it won’t allow you to fly a far distance, this technology opens up a new window of opportunity for what’s to come. Despite only flying five inches above the power transmitter, there’s a lot of complex circuitry infrastructure involved in getting this drove to fly without requiring onboard batteries. If strides in wireless charging continue on this level—from both academics like Professor Aldhaher and from drone enthusiasts—I’m sure it won’t be long before this technology at our disposal. Share the post "New Technology Powers Drones Wirelessly"